So let’s say you have an extra Mac Mini laying around that is just not put to use, maybe the internal hardware pooped (oh, the worst pun for this isn’t it) out and it’s just good for nothing… well, don’t be so fast to flush that broken Mac Mini, you can turn it into a toilet paper dispenser! I mean, I don’t know why you would, but I guess why not if you’re into geek chic decorating? 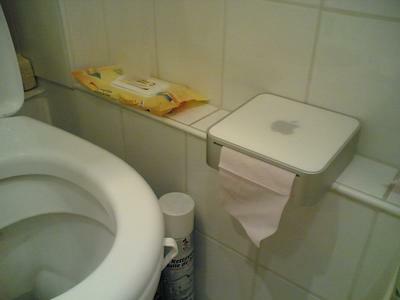 OK ok ok, it’s Friday so why not have a little fun with a Mac Mini used as a toilet paper dispenser? Dumb, I know, but it’s not our fault we promise, this was found on TwitPic via AppleSpotlight on the Twitters. If you’re not following us on there yet, you should be. haha! that is even better than the huge computer toilet paper dispenser i saw a few months back. Come to think of it, I think that was a mac too. the mini mac wouldn’t make a bad tissue dispenser for the desk though.